A New Westminster proposal on a special date that almost blew away! While weddings are definitely my favourite event to photograph, I have to admit that I have a soft spot for capturing proposals, like M and A’s New Westminster proposal. There’s so much excitement, nerves and planning that goes into a proposal. And when that special person finally says yes, I can’t keep the smile off of my face. Who wouldn’t want to capture that moment? M reached out to me to help plan his New Westminster proposal this summer. 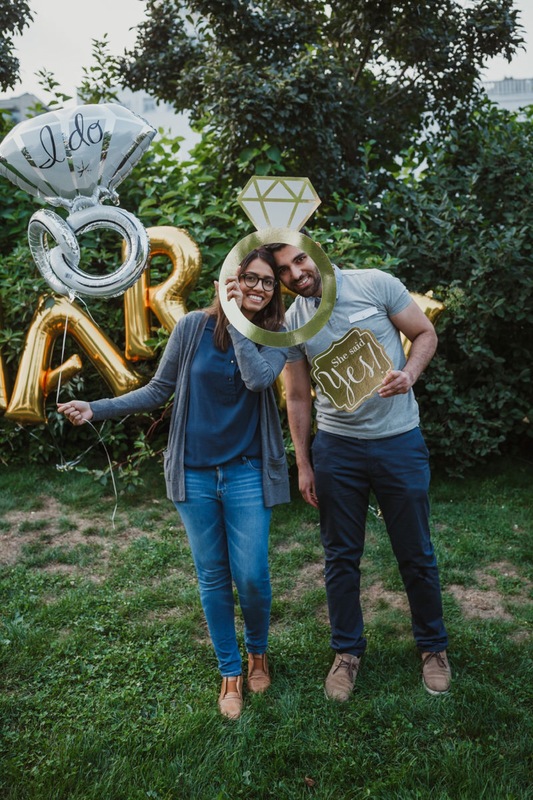 He knew he wanted to pop the question in New West and he had even scouted potential spots. M sent me a Powerpoint presentation of a few New West locations with videos and photos. This guy was prepared! While M wasn’t sure on the exact location, he knew it had to be a New Westminster proposal and that it had to happen on August 23rd. Because exactly a year ago, on August 23, 2017, M and A had gone on their very first date in New West. And, if all went well with the proposal, they planned to tie the knot on August 23, 2019! On the day of the proposal, M and I met ahead of time to see which one of his scouted spots would work best. We settled on a quiet area at the end of the Westminster Pier Park. To set the scene, M had purchased giant letter balloons spelling out, “Will you marry me?” In fact, he had so many balloons that it took three cars and a few friends to get the balloons from the party supply store to the New West pier. But A loves balloons and M knew this would be the perfect way for him to pop the question. As he installed the balloons, all of a sudden a string came untied and the “O” balloon flew away. I swear, it looked like M had just seen a ghost. His face went white and his mouth hung open. But, one loose balloon was not enough to ruin this New Westminster proposal! I suggested we change the phrase to, “Marry me?” which ended up looking a lot better in the end. Finally, the moment came for M to surprise A, get down on one knee and ask her to be his wife. Exactly a year after their first date in the same neighbourhood, A said yes. We celebrated with ice cream at the market and some fun shots of the newlyweds-to-be! Planning a proposal? Get in touch to document one of the most exciting moments of your lives together! I LOVE this Vancouver proposal. So GORGEOUS! This New Westminster proposal is so sweet! I love all of your images – their wedding photos are going to be AMAZING with you as their photographer! Thanks! I am not documenting their wedding though but I am sure it will still be great! They are such a cute couple. Oh my gosh, the balloons! That is so cool. Love this New Westminster proposal!! As a fellow Vancouver wedding photographer, this session is amazing! Thank you for sharing! Oh my goodness! This proposal was SO sweet! you’re my favorite Vancouver wedding photographer! Gah I just LOVE proposals and love it when couples document the day! Yes it was really adorable! I never see blogs about proposals, so I loved reading this and getting to see the images. This looked like such a beautiful, intimate and special proposal and how awesome that now they have documented memories of it. Gorgeous work! Thank you for the kind words and yes, despite the slight hiccup at the beginning – it was definitely a special proposal. Aww that is such a cute setup and proposal! You captured the moments beautifully, I am sure they are happy to have you as their vancouver wedding photographer. What an adorable Vancouver proposal! I love that they got ice cream after she said yes and that you were able to capture her ring in such a cute way. Hopefully you get to shoot their wedding next year! Thank you and here’s to hoping! If not then I am just happy I was able to document this occasion for them.